'200 exemplaires en un an par son constructeur', or 200 cars built in one year by it's constructor. That was how many cars a company should make for it's homologation in Group B. And Peugeot was the first to combine a mid-engined car with 4wd, as the 037 was RWD and the Quattro had it's engine in front of the driver, on top of the front-axle. And a big hit it was. In it's year of introduction (half-way the rally-season) Ari Vatanen was 4th in WRC taking 3 wins, but in it's first full year (1985) Peugeot won the constructor-championship and Timo Salonen took the driver's championship in a 205T16. Peugeot, or rather PSA, took that constructor-championship before in 1981 without a Peugeot by the way. They used the infamous Talbot Lotus Sunbeam. So did the T16 have anything to do with the 'normal' 205? Obviously not. Just the doors, windshield and headlights were shared. And the looks. A bit. You all know Group B died quickly. A series of major accidents, some of them fatal, were blamed on their outright speed and lack of crowd control. 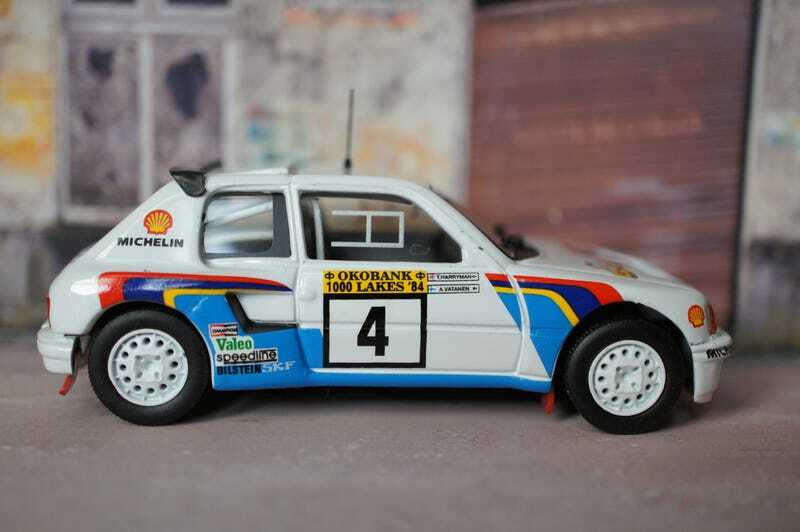 After the death of Henri Toivonen and his co-driver Sergio Cresto in the 1986 Tour de Corse, the FIA killed Group B. Peugeot however continued to use the T16, it entered several Paris-Dakar editions (winning both 87 en 88 edition, as well 89 and 90 with a 405T16 which was actually a redeveloped 205T16) and it even competed in Pikes Peak. But that one wasn't won if I remember correct. This is my only 1/43 rally-car but while writing this I suppose I've made a decision: I need more. Whether it's French or not. That's it for this FF. Don't forget your baguette next week: as it's snowing over here I'm thinking about something for the beach. And no: it's not a Mehari!